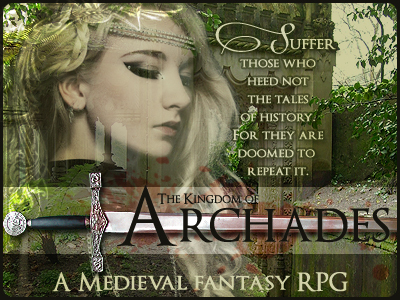 The Kingdom of Archades is an active, daily-posting, member driven writing community who welcomes creative, quality, and mature people seeking an RP home. In a realm where the tides of power have flowed strong for centuries, the force of change rises like the moon. The Deveraux family, in power for two hundred years, finds itself on the cusp of a crisis from within the family.. and without. The Sandovals are garnering allies to reclaim the throne. The lines are being drawn. Enemies and allies struggle with the ages old question – whose side will they choose, or will they write a new chapter in the history of Archades? The Kingdom of Archades is an original, medieval fantasy RPG, set in a highly active, open forum open for over one year where the emphasis is on quality, creative writing and shared ideas. New characters have been added for claims and are always welcomed! Simple applications. No word count per post. 18+ players preferred, please.